In the early 90s I started to read cookbooks for recreation. This was a bit of a challenge because I lived outside United States and my skills in other languages were (and are) poor. The only library available to me was a small one set up in a "support unit" for use of American NATO personnel and their families. Still I found it entertaining to read about food and my interest has continued, leading to a somewhat risky and expensive hobby for me. I have a hard time resisting the temptation to buy the cookbooks I read and hesitate to admit how many I have acquired. When we returned to the large libraries in Virginia I indulged my reading habit regularly. One of the earliest recipes I culled from a library book is the following. It is still one of my favorites and it continues to perform for me even though I no longer live near sea level. Combine the chocolate and butter in a saucepan and heat over low heat, stirring until melted. Off the heat stir in the sugar, eggs, orange zest and vanilla and beat by hand just until combined. Add the flour and nuts and stir but only until the flour is incorporated. In an ungreased 8X8 baking pan, spread the batter smoothly. Place in the oven and bake for 30 minutes or until a cake tester comes out dry. Cool on a wire rack. When completely cooled top with glaze. Bring the cream to a simmer over medium heat or in a closely monitored microwave. Remove from heat and gently stir in the chopped chocolate or chips and add the orange zest. Cover and allow to sit for 3 minutes until chocolate is melted. You may find that the chips don't melt completely until you stir for a few minutes. Let the glaze cool for 5 minutes then pour on to the brownies and spread it evenly. Let the brownies sit at room temperature until the glaze has set, at least an hour. Cut and serve; I like these cut somewhat smaller than usual since they are so rich. Some Ghirardelli chocolate chips are pretty big. I advise chopping them before using in the glaze. If you can get your hands on some Callebaut chips, they work wonderfully here. I've lined my pan with foil the last couple of times I've made these, leaving excess foil so I can lift the brownies out of the pan before cutting. I find it easier to cut the brownies on a cutting board and I also don't cut into the finish of my baking pans which ultimately leads to rust. 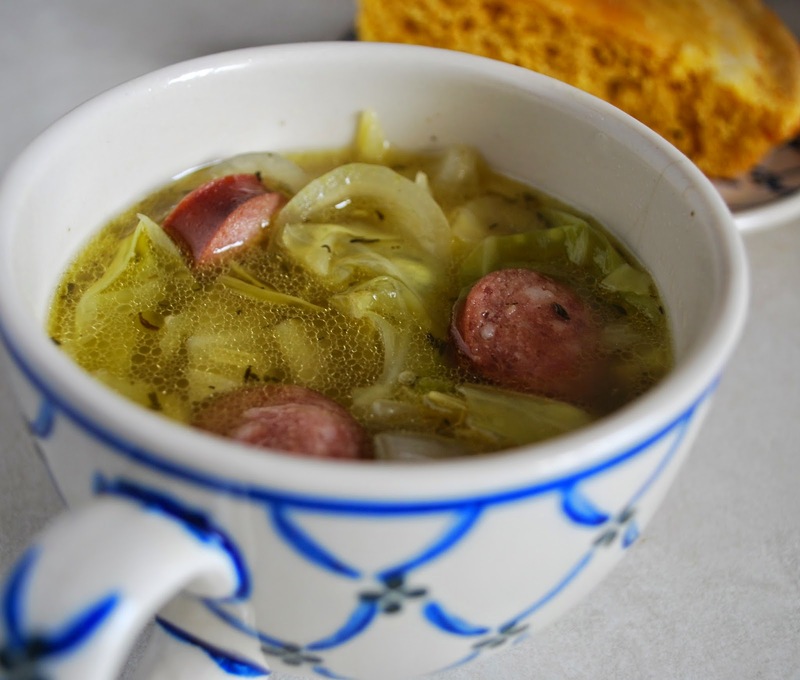 Like most of the recipes from this cookbook, the soup is simple, streamlined, easy to cook, and tasty. Also it puts me in mind of Irish food, appropriate for next month's celebrations. I served the soup with skillet cornbread but I think it would be good with beer bread too. Put 2 T olive oil in a large pot over medium heat. Cut the sausage into bite-sized pieces; I did thin slices the first time I tried it but I might go even smaller next time to distribute the meat more evenly through the soup. Add the sausage to the hot oil and cook, stirring occasionally, until browned on most sides, 5-10 minutes. Slice the onion into 1/2 inch thick slices. Trim the cabbage; cut into quarters, then cut out the core. Cut crosswise into 1/2-inch ribbons. Remove the sausage with a slotted spoon, leaving as much oil as possible in the pot. Raise heat to medium-high and add the onion and cabbage. Sprinkle with salt and pepper and cook, stirring occasionally until they begin to soften, 3-5 minutes. Add 1 T caraway seeds. Stir until fragrant, about 1 minute. Then add 6 c stock, cinnamon stick, and 1 teas thyme. Return sausage to the pot and bring the soup to a boil. Lower the heat so it bubbles gently. Cook 5-10 minutes (longer at higher altitudes) until the vegetables are tender and the soup thickens a little. Remove the cinnamon stick and serve. This is another new recipe for me; it was recently featured on an America's Test Kitchen episode (watch it here). Test cooks assure extra oatmeal flavor by making oat "flour" in a food processor (I would guess a good blender would do the trick, too). It's worth the effort to make the topping although prep time is increased; it adds a sweet crunch to the muffin. These are as good as the show promised they would be. Melt the butter in a medium, microwave-safe bowl or medium saucepan. Add all remaining ingredients and toss to thoroughly combine. Set aside. Grease and flour the muffin tin. In a skillet, melt 2 T butter. Add the oats and cook over medium heat until the oats become golden and begin to smell similar to popping popcorn, about 7 minutes (give or take). Process the oats in a food processor until you have a fine meal, about 30-60 seconds. Add the remaining dry ingredients (in the case of muffins, sugar is included in wet ingredients). Pulse until combined. In a large bowl melt the 6 T butter in the microwave. Add sugar, mixing until smooth. Whisk in the eggs and milk. When liquids are smooth add the oat mixture. To reduce lumpiness ATK suggests the following, " Using whisk, gently fold half of oat mixture into wet ingredients, tapping whisk against side of bowl to release clumps. Add remaining oat mixture and continue to fold with whisk until no streaks of flour remain." Allow the mixture to sit for 20 minutes to thicken. In the meantime, prepare the oven by placing the rack in the middle position and preheating to 375F. Fill the muffin cups, dividing the batter evenly using a large spoon or an ice cream scoop (my favored method for muffins for over 30 years). Use about 1/2 c batter per cup which will fill the cups to the rim. (This may be where I gained extra batter; I filled to about 1/4 inch below the rim.) Sprinkle the topping on the muffins (ATK indicates that 2 T is sufficient; I couldn't fit that much on each muffin). Bake for 18-25 minutes until a toothpick stuck in the center comes out clean. For even cooking turn the muffin tin around halfway through the baking period. If you have extra muffins, place tins side by side on the rack, if they will fit. Muffins should cool in the tin for 10 minutes; then you may remove them and place on the rack for further cooling, if desired. Eat them warm or cool. These are not bad reheated in a microwave for a short time--don't nuke them, though. Note: Since these are cooked in small cups as opposed to a loaf or cake pan, the only adjustment I made for elevation was to measure the baking powder and soda scantly. For the majority of cooks, I advise following the recipe as directed. In my neck of the woods we are having a very mild winter, so much so that it feels like spring and I'm afraid the trees are going to flower. Before the chill is completely gone from the air, I wanted to share my new favorite hot chocolate recipe. The mix has both chocolate and cocoa powder, so it's very chocolatey. 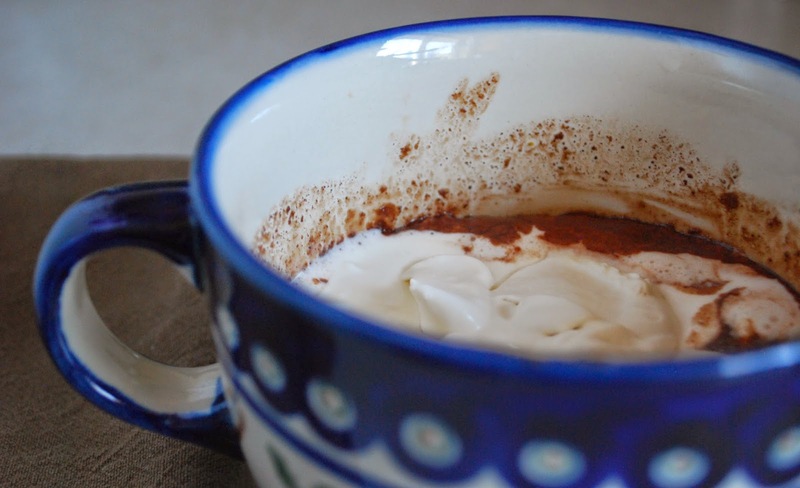 There is a slight bit of graininess in this hot chocolate, especially at the end of the mug, but the flavor and ease of preparation make it worth it to me. Smitten Kitchen posted a modification of this recipe here, in case you're interested in a sweeter, non-dairy version. Place all ingredients in a food processor and process until powdery, 30-60 seconds. Store in an air-tight container at room temperature. The original recipe says it will last 2 months, but at my house the mix has been consumed too fast to verify that claim! To serve, heat 1 c milk over medium heat in a saucepan. When it starts to steam and bubbles appear around the edge, add 1/4 c mix. Whisk constantly and continue to heat until simmering, 2 or 3 min longer. Pour into a mug and enjoy. Add 1/3 c instant espresso powder to the processor with the other ingredients. Process the zest of 3 oranges with the sugar for 15 seconds before adding the other ingredients. I suppose it won't surprise those who know me that I read recipe blogs from time to time. I discovered this recipe a couple of weeks ago and was anxious to try it since I have lots of frozen raspberries and love this particular flavor combination. I believe this blogger bakes at an altitude over 4000 feet. I've communicated with her about whether she adjusts recipes and I think she said she doesn't change recipes for cookies. It follows that this recipe must work at her altitude. However, since I am at a higher elevation (5000 feet) I tweaked the recipe; see in parentheses. I can't tell you what you will experience if you bake these at sea level. I'm hoping the recipe will work for sea level bakers because these are fantastic cookies. Set oven at 350F to preheat. Prepare a baking sheet with parchment paper, a silpat, or butter it well. Mix flour, baking soda, salt, and cocoa together in a medium bowl. Using a mixer, cream together butter and sugars. Add vanilla and egg and combine. Gradually mix in flour mixture until just combined. Carefully stir in the chocolate chips and frozen raspberries. The dough is quite stiff; chips and berries won't be quite incorporated until you form the dough into mounds and place them on the baking sheet. Some berries will stay whole and some will break up. Using a tablespoon, place rounded portions of dough onto the sheet about 2 inches apart. As much as possible try to contain the berries in the dough, although some leakage is all right. Bake cookies for 10-13 minutes until they are set but not overbaked. They will be somewhat soft (but not soggy) in the middle. Half way through the baking time, rotate the pans to ensure even cooking. Remove from the oven and allow to rest for 3 minutes. Place on a rack and allow to cool. If you snitch while they are still warm be prepared for some disintegration (delicious, though). I have not tested these cookies with fresh raspberries nor does it sound like twopeasandtheirpod.com has tried anything but frozen berries. The original author indicates that the balls of dough may get too wet if you allow the raspberries to melt. She suggests keeping them in the freezer before baking. I have a hard time fitting a baking sheet into my full freezer at any time. I suppose refrigerating would help, too. I baked mine both in the oven at the same time, although I placed the first batch in while I was readying the second pan. This meant I had to remember two baking times. A commenter to the blog suggested upping the raspberry flavor of these cookies by using Chambord, a raspberry liqueur, instead of vanilla. It's a suggestion I hope to try but haven't so I can't say what the result will be. In my ongoing quest to find easy, delicious crockpot recipes I came across this one, which is good for days at home (at least afternoons) combined with busy evenings. Everyone in the family loves it, so much so that I've made it several times hoping for leftovers to use for pictures but every last piece has been eaten! This time I set aside the piece to photograph before we sat down to eat. The original recipe says to serve over rice, but it's delicious over quinoa, too. Quinoa is an edible seed that originates in the mountains of South America. It's easy to cook and has a delicious, nutty flavor. Source: I don't remember where I found this originally, but I found a number of variations online several of which link back to 365 Days of Slow Cooking. Combine flour and pepper in large Ziploc bag. Add chicken. Shake to coat with flour mixture. Heat oil in skillet over medium-high heat. Brown chicken about 2 minutes on each side. Place chicken in slow cooker. Combine soy sauce, vinegar, ketcup, sugar, garlic, ginger, and pepper flakes in small bowl; pour over the chicken. Cook on low for 3-4 hours. Add cashews and stir. Serve over rice or quinoa.